There are many ways in which teeth can be damaged. While a traumatic accident can dramatically injure teeth in an instant, erosion can ultimately do just as much damage over the course of several years. But help is available, and tooth erosion treatments and preventative tips are available. In this blog post, Chicago restorative dentist Kenneth Coffey explains the most common causes of tooth erosion and how this condition may be treated. Acidic Foods and Beverages - Strongly acidic food and drink, from soda to citrus fruits, can cause serious damage to teeth when consumed in excess. Over time, these acid-heavy foods and beverages can cause discoloration and wear on a tooth’s enamel. Sugary Foods and Beverages - Without a strong dental hygiene routine, a diet high in sugar can be a welcome invitation for bacteria to thrive within your mouth. As the bacteria feed on the sugars in the mouth, they release acids, which eat away at tooth enamel. GERD or Acid Reflux Disease - Many enamel-damaging acids come in the form of foods and beverages. In addition, acids from within the body can come into contact with the tooth enamel. Patients suffering from acid reflux disease or its more severe form, gastroesophageal reflux disease (GERD), are more likely to experience tooth erosion. When excess stomach acids travel up the esophagus and into the mouth, they can wear away tooth enamel. Chronic Dry Mouth - Your mouth relies on saliva to wash away bacteria and food on a regular basis. When chronic dry mouth becomes an issue, patients are not able to naturally wash away bacteria and food particles, which can eventually lead to tooth erosion. Physical Wear and Tear - Damage to teeth can also be the result of physical erosion over time, caused by actions like chronic teeth grinding (bruxism) or brushing one’s teeth with a hard-bristled toothbrush. While these are the most common causes of tooth erosion, they are not the only causes. Tooth erosion can also be caused by anything from certain medications to prolonged bulimia. What Are the Most Effective Treatments for Tooth Erosion? The most effective treatments for tooth erosion depend on a patient’s individual situation and the severity of the patient’s tooth erosion. If tooth erosion is caught at an early enough stage, preventative care is often recommended. Dr. Coffey will provide you with tips that are tailored to your unique needs. In addition, the enamel of teeth can be improved through the use of fluoride-enriched enamel strengthening toothpaste or mouthwash. If the erosion of a tooth is significant, on the other hand, enamel-building products and preventative care may not help. 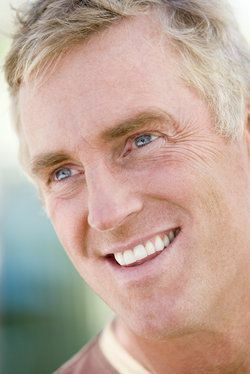 In this case, effective treatment may involve the use of dental bonding, porcelain veneers, inlays, onlays, or dental crowns to restore the teeth. If you are experiencing signs and symptoms of tooth erosion, now is not the time to wait. The sooner you seek treatment, the sooner our experienced team can stop the progress of erosion and set you on a new path toward stronger and healthier teeth. To schedule an exam with Dr. Kenneth W. Coffey and learn more about tooth erosion and your treatment options, contact our general and restorative dentistry office today.